This is one of this weeks HubNugget nominees. Very well written. 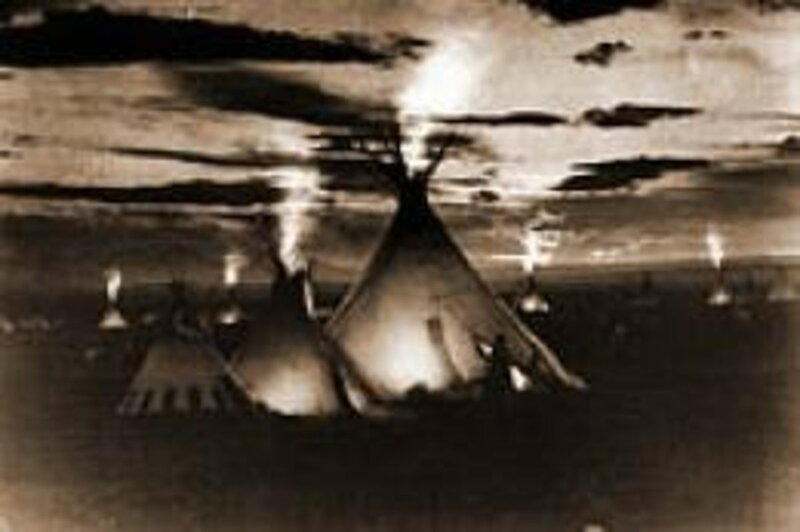 The spiritual philosophy and teachings of Native Americans, also called First Nations, are kind and gentle lessons to learn. First Nations humans are some of the kindest humans I have ever met. We can learn a great deal from the respect their culture shows the planet. 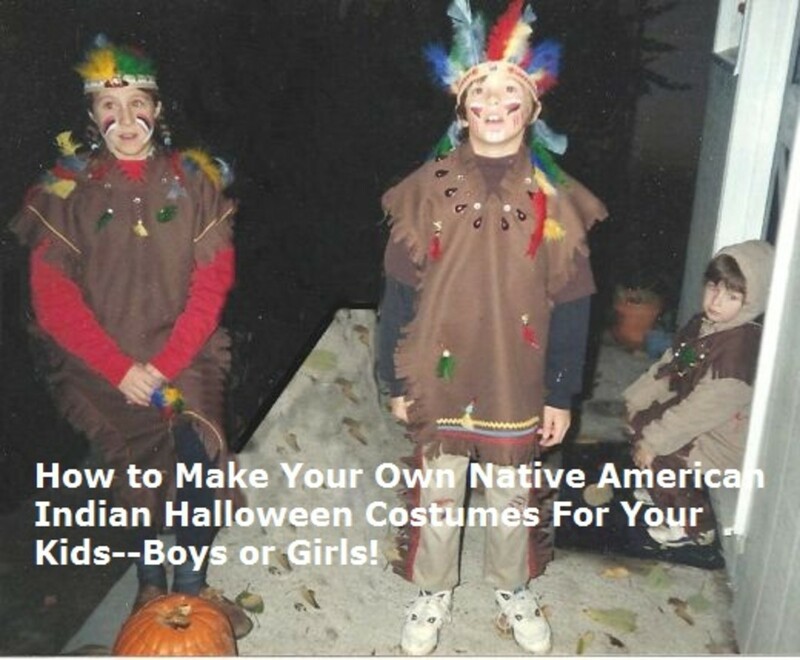 Today I want to share with you how to make a Native American Medicine Bag. 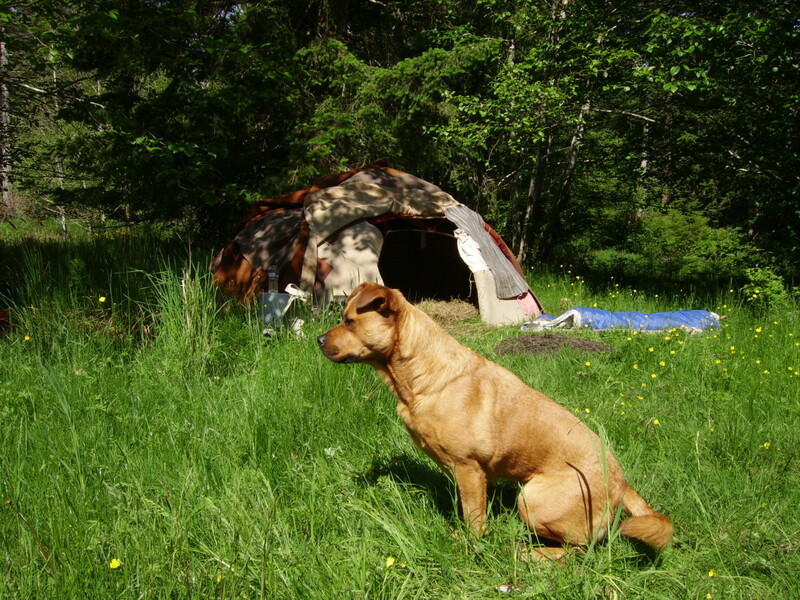 At the end of this article you will find a brief introduction and a link to my hub explaining the Sweat Lodge and ceremony. A medicine bag is quick and easy to assemble. You can decorate it with drawings, beads, hang fringe on the bottom if you choose. Each bag is a unique piece of art. This project usually takes about 45 minutes. A 12 inch round piece of tanned leather, buckskin, deerskin, rabbit, etc. A smaller three to four inch square or oblong piece of leather. You can recycle old leather purses, jackets and clothes to use for your material if you don't have tanned hide available. A leather hole punch. If you do not have a leather hole punch you can use a sturdy sewing needle. Using a needle slows down the process but it still doesn't take very long. 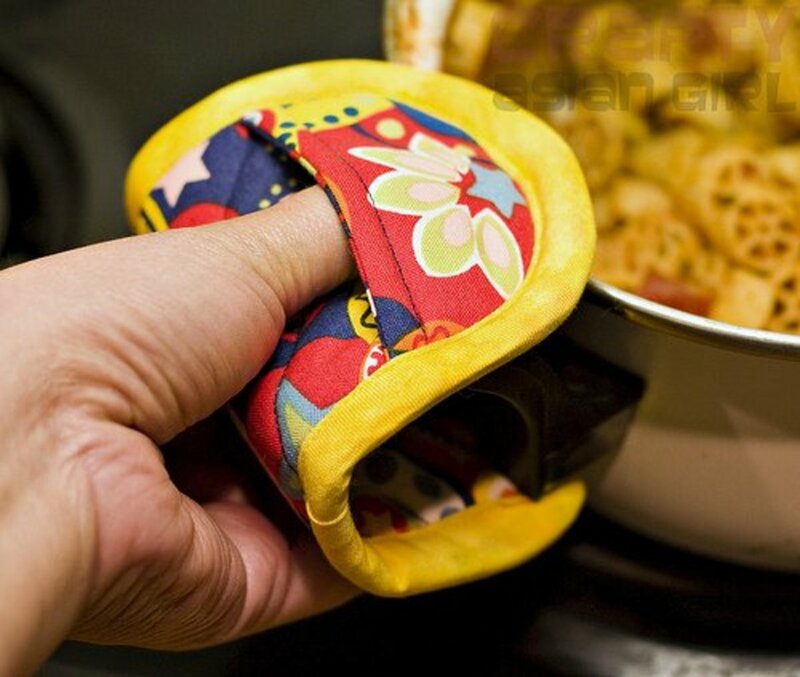 Use a thimble to help push your needle through the leather. Two or so feet of waxed, or other strong, thread. A small amount of herbs, weeds and/or small talisman that has meaning for you, to place inside the completed medicine bag. I have cedar for kindness, and sage for positive energy in my medicine bag. My partner has a wolf tooth in his. I made a bag for my friend and placed a 3/4 inch ceramic Buddha inside to bring her good luck and fortune. Be creative and use something that means something to you, an object that brings you comfort and solace. Yes, many are around me always. Nope, when you are gone you are gone..
First, we will make the lace that goes around your neck. Take the 12 inch round leather and with a slow and steady hand, begin cutting around the perimeter, 1/4 inch in from the edge. When you come full circle to your starting point, drop down another 1/4 inch and go around again, and again, and again..until you have a leather lace long enough to hang the medicine bag around your neck. The lace I cut for my bag is approximately two feet long. Now pick up the smaller piece of leather, fold it in half and cut it in whatever shape you decide you want your medicine bag to be. Pictured above, is a bag I made recently. You will see that is is an oblong shape with rounded edges. You can leave the sides square if you like, making it easier to line up the hole punch holes. Take your folded piece of leather and punch holes through both sides,using the smallest setting on your punch, placing them as close together as possible. I have included instructions below for you to add fringe to the bottom of your bag for a funkier look. Thread your needle with the waxed thread and stitch your bag together, making sure to line up the holes correctly. 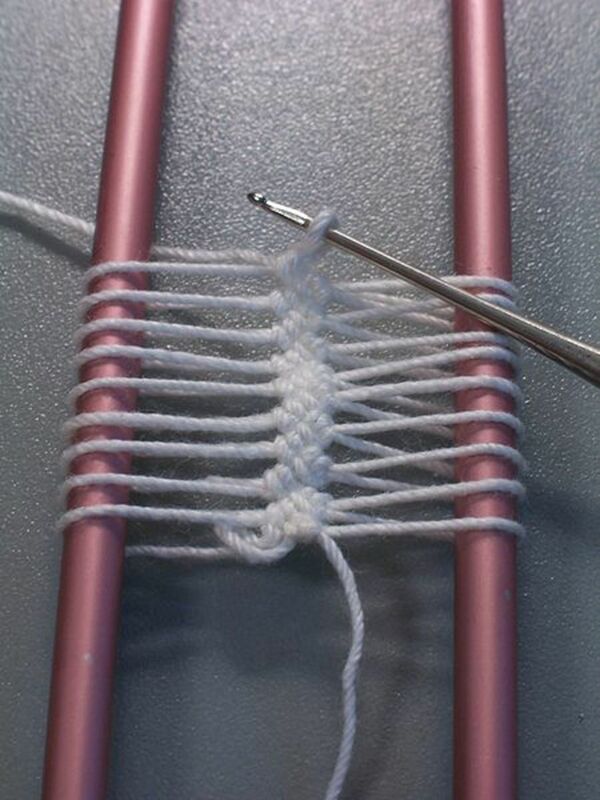 Pull your stitches tight and make sure to tie of the thread securely and tightly so it won't unravel on you. If your bag is square or rectangular, accordion the top corners. Put your hole punch on a setting that will make a hole large enough to allow the leather lacing to go through it. Punch a hole through the accordioned edge. This will create four holes. Do this on both sides of the bag. If you have chosen a rounded top, don't accordion the edges, simply make four holes, two each lined up on both sides. Place your medicines in the bag, cushioning the harder objects with the herbs and weeds. Thread the leather lace through the four holes created in the accordioned edge, pull tight. Without cutting your leather, thread it through the four holes you created with your hole punch on the second accordioned edge, making sure to leave an equal length of lacing on both sides so the bag will hang evenly when you place it around your neck. Pull the leather tightly, take both sides of the leather lacing and gently but firmly tie the together. Ta-da! 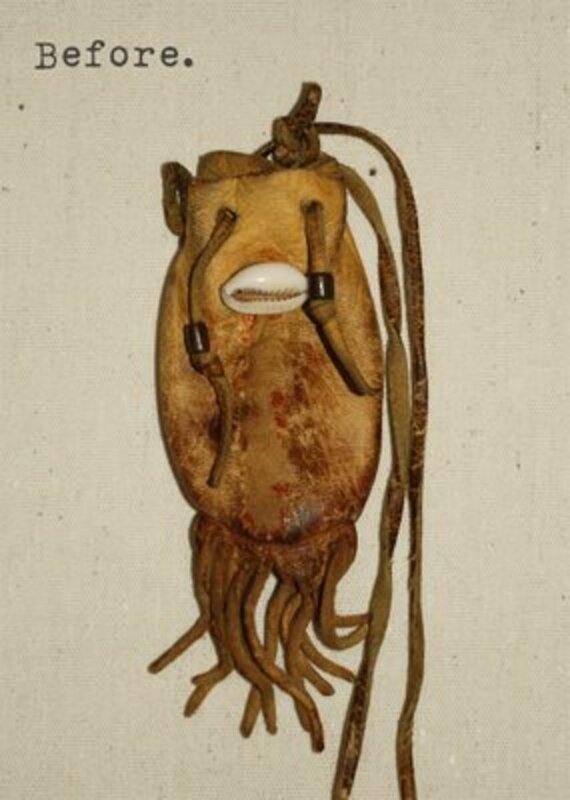 You have created a Native American Medicine bag to wear around your neck to protect and comfort you. A Medicine Bag is a quick and meaningful gift you can make for friends, family and loved ones. Before you punch holes in your leather, separate the front and back pieces by cutting them at the bottom. Measure the bottom of your bag then cut a small piece of leather approximately 1/4 inch narrower than the bottom of your bag, in a rectangular shape. Carefully make three or so evenly spaced cuts up the leather, making sure not to cut completely through the top, leave 1/4 inch intact on one end. Place the fringe you have just created between the two pieces of leather you are using to make your medicine bag, intact end between the two bottom pieces of your bag, the cut ends protruding from the top of the bag. Using your hole punch on the smallest setting, hold all three pieces in place and go around the edge making holes as close together as possible without breaking in to one another. Make sure to pull your stitches tight. Turn your bag inside out and you will see you have created a decorative fringe hanging off the bottom of your bag. 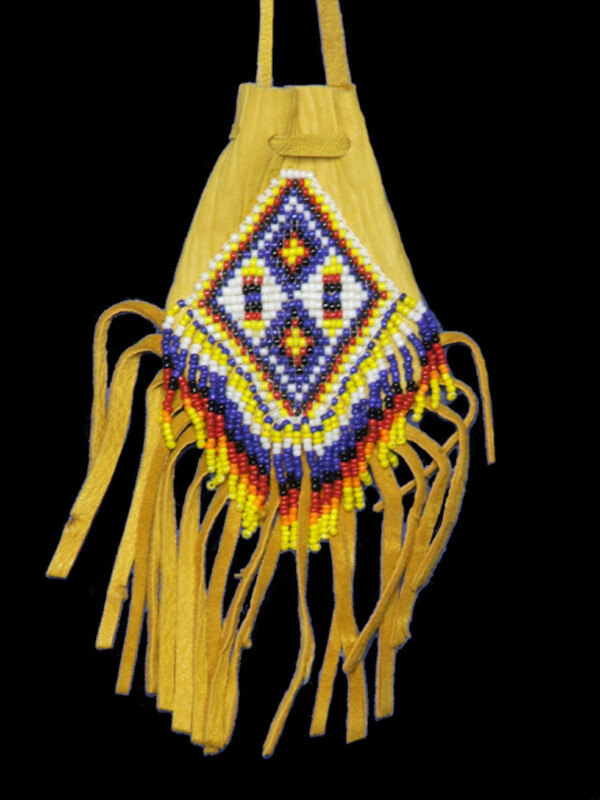 A medicine bag is worn around the neck to protect and nurture the wearer. Create an altar in front of the entrance to your lodge. 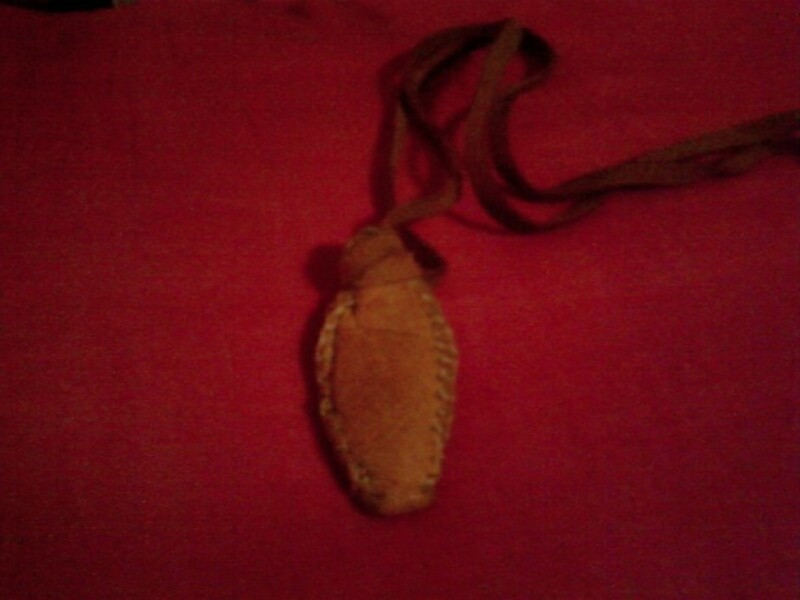 to lay your medicine bag on for blessings during the ceremony. Hi Alexander, I am thinking of getting my DNA tested. Some of my friends have, with exciting results. My DNA tests showed me that I am zero percent Native American. Two of my siblings are though. Thank you for your kind words Manalito. I appreciate it. Very informative write-up.Thank you so much for the info. Hi Deborah Minter, Thank you so much for your positive comment. Harvesting herbs is definitely good for the spirits. Thank you Deborah Minter for your kind comment. I always wear my medicine pouch when I travel. I feel protected by the herbs and amulets I have placed inside. 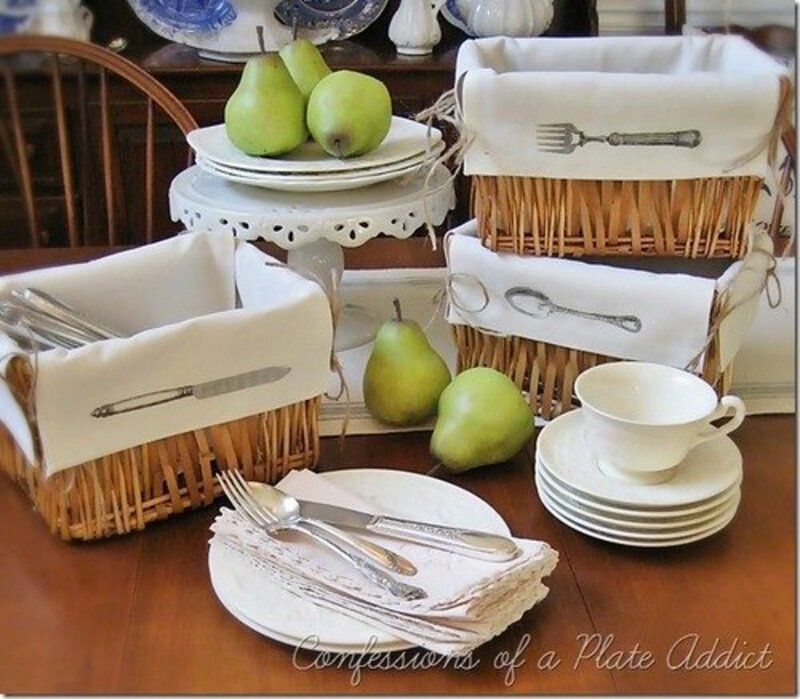 Thank you for sharing how to make this item. I like to harvest herbs, and dry them. I remember thinking how convenient it would be to carry them on me when I traveled. Good article! Where did you get the puwaka that is in the pic titled "before?" Also, was there anything in it when you found it? Thanks for your comments Standing Wolf. The significance of each item in one's medicine bag is usually deeply personal. I get comfort and feel protected when I where mine. My Holy man always told me to never tell anyone what is in my medicine bag. Because it is personal. 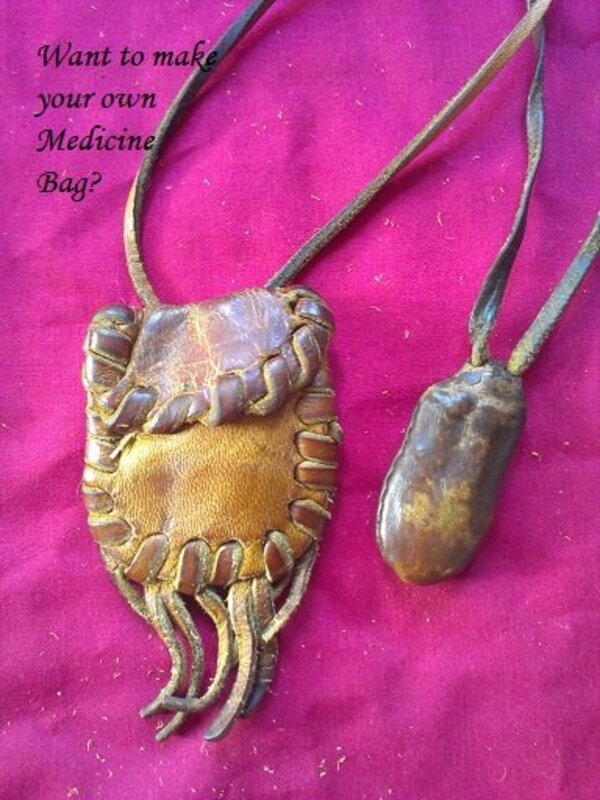 Hi Lisa42, it is very simple to create a medicine bag, and very rewarding. Thank you for reading. Thanks for sharing. You make it sound so simple! Hi Alana, the first picture in this article is a finished medicine bag. You can also go t Google Images and google 'medicine bag or pouch' . You will see many awesome ones. Thanks for reading. were is the after picture ?! Thank you again creativespirit, I am going to figure out how to link to your site, we could both do each other some good on exposure perhaps! I did it. It wasn't as difficult as what I thought it might be. Maybe it will help both of us. Hi there creativespirit63, thank you for your kind words. 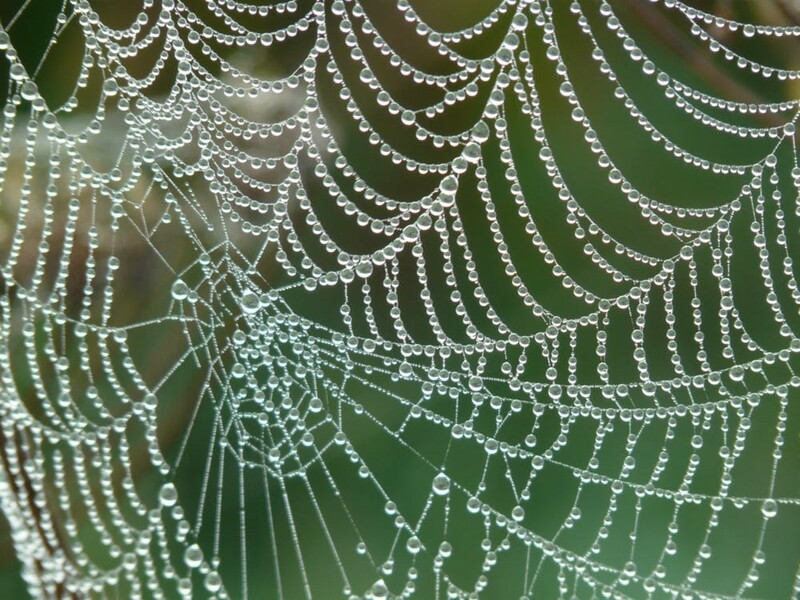 I appreciate you linking to me if you can. I haven't been on hub pages much and I forget how to do the most simple tasks when I do not keep them fresh in my brain. make it a great day! I like this! Thanks for sharing this project. I was looking for these kind of directions a few months ago. I just wrote a hub about Devil's Tower that had bit in it about the spirituality of the Native People of the plains. I'm going to try to link to this if I can figure it out. I am still learning. Thank you again Foolwithajeep, for sharing your experiences. My guy is half Blackfoot and through him I became more aware of 1st Nations culture and traditions. In my medicine bag I carry a bear tooth, small silver bear, jade pendant and a silver pendant. All of these items carry the energy of the people that gave them to me. I have put my medicine bag on the alter by the doorway of the sweat more than once to bless it and it's contents. Onah..
my family went to an emerald mine in North Carolina and the stones and crystals we used were ones that we found, so we look at the stones as having more positive power because the family bond of the time spent hunting for them.I have about an eighth to a quarter cherokee and my kids have more cherokee and some blackfoot indian in their bloodline so we respect the earth and all of its plants and animals. we garden as well as hunt and we leave nothing to waste. we also share any overabundance with the needy. I was glad to find this site as I have been looking for more info on my medicine bag I knew about the stones but the herbs and such i was unaware off so thank you for the help. I am not even a tiny bit native but I believe in the power of the medicine bag also! Hi Jill, thank you for your interest. I don't understand what you mean by make the rocks work. I am sorry I am sorry I cannot help you. Howdy ma'am - I am just a tiny bit native. But I love the sweat lodges, and I believe in the power of the medicine bag. Thank you for keeping up the tradition. Hi Mr. Happy, Thank you for your kind words. I have been away from hubpages for awhile but now I am back I will go take a look at your site. Make it a great day. I can't thank you enough for writing this. I am not exactly a great handy-man and so the instructions here were of great help. I will follow them because it doesn't seem that difficult and I need a couple of bags for medicine herbs. It truly warms my heart to see how much you've grown.